At Beacon Craft Workshop, we emphasize exploration, choice, and developing skills. When children explore materials together and design and implement projects, they experience a special joy, determination, creativity, and empowerment. Ilana received her Masters of Arts in Teaching at Brown University and taught third grade at a progressive public school in New York City called the Brooklyn New School. In 2011, she co-founded the Brooklyn Craft Workshop. She also works as a potter and took classes at Haystack Mountain and Penland Schools of Craft. She knows first-hand how incredibly fun it is to explore materials and create alongside other passionate makers. Ilana loves nurturing a spirit of collaboration among students. Working together, students ask questions, solve problems, and find even more joy in the process of making things. 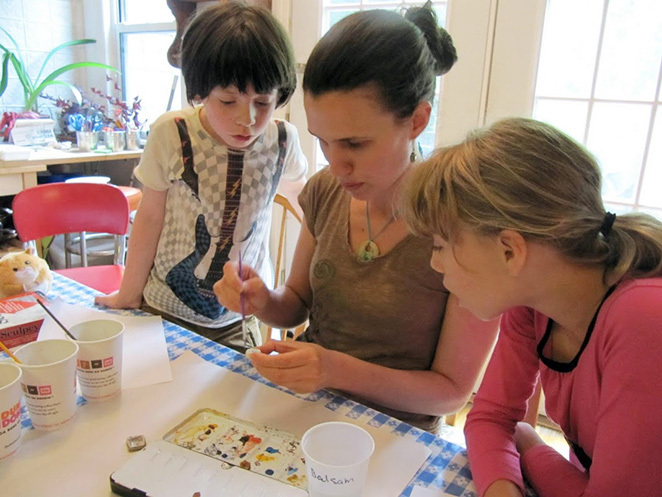 After moving upstream to the Hudson Valley, Ilana founded Beacon Craft Workshop! She lives with her husband Bryan, her daughter Samara, and Schermerhorn the cat. We view the classroom space as another “teacher.” Filled with light and warm colors, it welcomes students. The shelves and walls display beautiful objects to observe as well as use in projects. The aesthetic and orderly environment invites students to work with care, just as it provides the space to test ideas and get creative. Students learn how to use the tools, materials, and space, so that they feel the shared studio is their own.